We are heading home today from a week in Phoenix. It's been lovely to spend the week relaxing with only a few minutes every day working. I must admit with almost a week in Florida and then another in Phoenix, I am missing my studio. Can't wait to get back to crafting! I've got a quick tutorial to share with you today. I just love this Festive Farmhouse suite - especially the dsp. Seeing anything in plaid just makes me smile. I've included a shopping list with links to my online store at the bottom of this post if there's anything you'd like to order. Fold Cherry Cobbler cardstock in half to create card base. Use Snail Adhesive to attach largest Very Vanilla panel to inside of card. Adhere the Festive Farmhouse Designer Series Paper strip to the front panel with Snail adhesive. Position about 3/8” from right side of card. Position Burlap Trim onto Very Vanilla panel and attach to back using dimensionals. Add dimensionals along edges of this panel and position onto card as shown in sample. 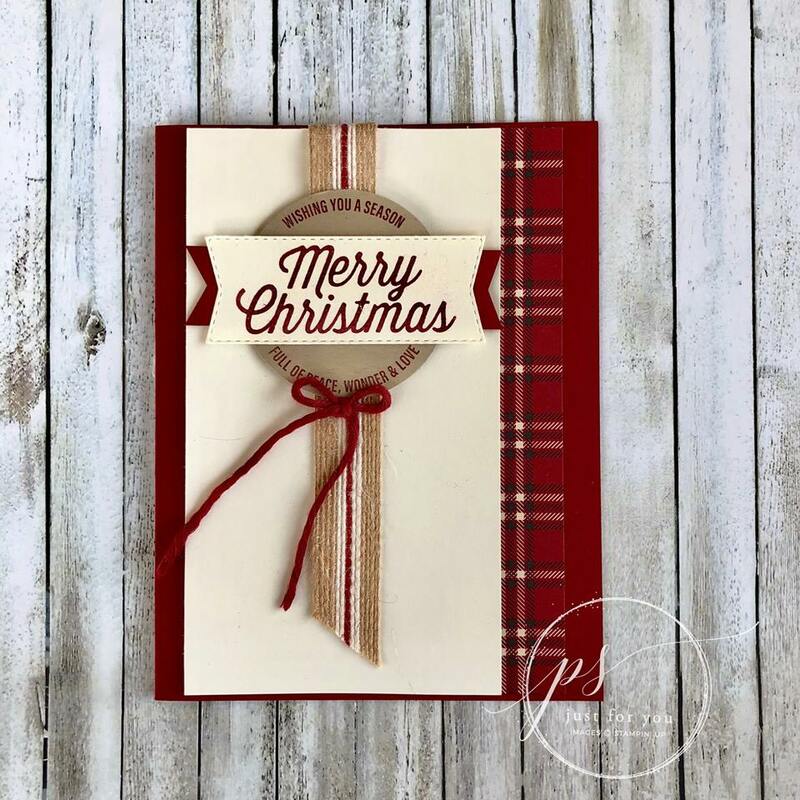 Stamp the Merry Christmas stamp with Cherry Cobbler ink – once on the Crumb Cake cardstock square and once on Very Vanilla cardstock square. Punch the Crumb Cake image with the 2” circle punch. Use the banner shape from the Framelits and cut out the Merry Christmas from the Very Vanilla cardstock. Use Paper Snips to flag the ends of the small Cherry Cobbler cardstock piece. Adhere to the Merry Christmas banner. Place the Crumb Cake circle over the burlap trim with dimensionals. Position the Banner to the circle with Snail Adhesive. 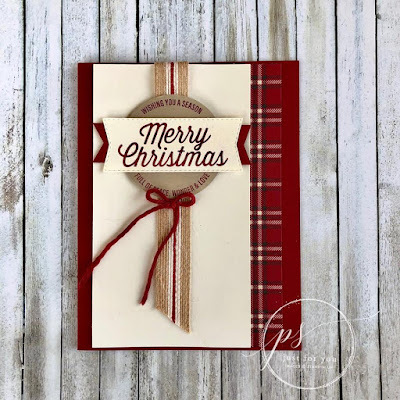 To finish the card, tie a bow with the Cherry Cobbler Festive Farmhouse Cotton Twine and attach to card front with glue dot.